Yup, that’s the big update and the reason for my absence from this space for the last month – I have moved my base, from Hyderabad to Gurgaon. The higher forces presented before me an option to move to Gurgaon and I grabbed it, for it seemed worthwhile. Weighing the options, leaving Hyderabad for me meant moving away from my friends and folks of long time, my treasured social circles which revolved around adventure and books and the very place which had been my base for the last 6 years. It also meant losing out on the proximity to the Sahyadris and the Western Ghats and several trekking trails. It basically meant a big deal. Movement to Gurgaon translates to new home and new beginnings. Also, it brings me opportunities for travels in the Northern and North Eastern regions. 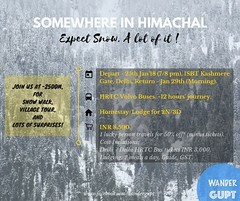 The cultural Rajasthan, the picturesque Himachal Pradesh and the romantic Kashmir have all come on the radar now. Expeditions in the Himalayas also should find place on the calendar now (reduced distance = doable in the limited leaves). 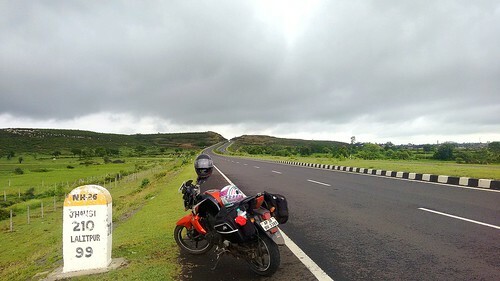 All of this and exhaustion of weekend travel opportunities from Hyderabad and familiarity with many a highways there was also the driving factor. Bringing you up to date, now for a month in Gurgaon (expensive place! ), I have paid the customary visit to Decathlon. Also, while I am missing out on the rains in Hyderabad and the treks, I have visited Bangla Sahib Gurudwara, Karol Bagh and Gaffar Market so far, also including the Pani Puri post midnight at India Gate. That is, after discounting the initial settling days. About the blog, while I had been away from the blog for this while, I had never been ignorant of it. Some pending travels I undertook from Hyderabad will still feature in this space and soon the travels from here too will start showing up on the blog. Do stay tuned as I will be posting frequently now. – Look me up on Facebook. You traveled all the way from Hyderabad to Gurgaon by bike? Best wishes for a new start. All the best and what a great way to travel, kudos ! When I left Hyderabad for a new place, it was a difficult step for me. A piece of me is still in Hyderabad. On the other note welcome to the so called NCR, looking forward to meet you in various meets and events. We will bump into each-other somewhere then! Delhi has a lot of opportunities for blogging and for pics. Welcome to Gurgaon my friend. Where are you staying? Let’s plan a meet soon. Welcome to Gurgaon my friend. Where you stay? Let’s plan for a meeting soon. Happy settling and happy exploring the north. घुमक्कड़ एक जगह कैसे रह सकता है ! That’s great news, more so for a rider! From South to North….an upward leap…..may u take such leaps in your career as well as adventures….and keep us updated about new places ….God bless U and wish U all the Best. I love the positive energy of yours when one has to shift from their comfort zone to a new place and again go through the process of imbibing the city. Surely, you will have a great life in a new place among new people and culture, All the best!